It takes a very specific kind of person to pull off our Flat Orange Shoelaces. First of all you need to be confident and 100% ready to have eyes on your feet from the moment you enter a room. Second, it helps if you’re a bit jolly. Not Santa Claus giving out presents to strangers jolly, but jolly enough to skip down the road like you mean it. Without being under the influence of alcohol. With orange the glass is always half full, so it helps if you’re that kind of person too. But there is another way of looking at this. 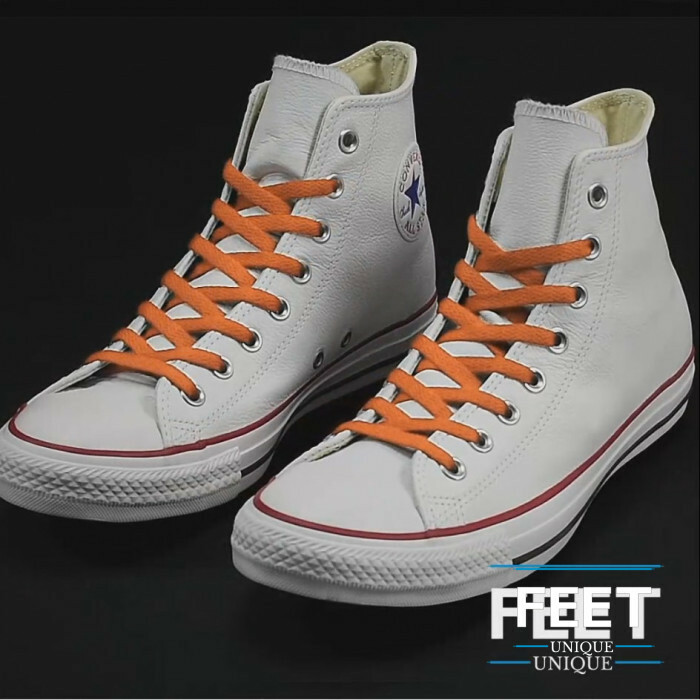 There’s no doubt that orange is the most charismatic color around, so maybe it’s best if wearers of orange laces are a bit more, you know, dull. Live life on the quiet side? Our orange laces can work for you too. So there you have it. Cry five times a day? Our orange laces can help. Already a happy soul? These can help tip you over the edge and into the next stage: bliss. We think that’s what comes next. We recommend these laces with a dash of green or black. But to be honest, they will liven up any outfit you can think of.